With every new movie he makes, it is becoming increasingly clear that Paul Walker has little to no charisma and on-screen presence. Producers keep playing up his good looks to tempt younger women into the theaters, ignoring the fact that it takes some presence to supplement good looks (still, he needs a haircut and a good shave). If there's nothing upstairs, even the dumbest people in the audience will eventually notice (uh, whatever happened to Freddie Prinze, Jr.?). It's pretty amusing that Walker (2 Fast 2 Furious, Joyride) plays Chris Johnston, the only non-archeologist in Timeline, the latest Michael Crichton adaptation. The other characters tower above him in intellect. Ah, how fitting. In his two high-profile outings in The Fast and the Furious series, co-stars Vin Diesel and Tyrese overshadowed him. It happens again here, this time by co-star Gerard Butler. Butler (Tomb Raider: The Cradle of Life, Reign of Fire) has more presence on screen, better lines, and a better love story than poor Walker, who has to wander around looking like he's lost. His very presence makes Timeline go from mindless escapist pleasure to dumb escapist pleasure. Johnston, Andre Marek (Butler), Kate Erickson (Frances O'Connor, Windtalkers, The Importance of Being Earnest) and Marine John Gordon (Neal McDonough, Minority Report, You're Killing Me...) enter a time machine so they can go back to fourteenth century France to rescue Johnston's father, Edward (Billy Connolly, White Oleander, Who Is Cletis Tout?). Edward became suspicious when his funder, Robert Doniger (David Thewlis, Besieged, Goodbye Charlie Bright) kept feeding him prime archeological information on his dig at Castlegard, France. It turns out that Doniger built a time machine that opened a wormhole into the past, directly to Castlegard. Edward insisted on going into the past, and is now trapped. Sounds easy, but the problem is that they emerge in the past just as a huge battle between the French and the English in the Hundred Year's War is about to begin. Timeline has the same quick pacing and just enough scientific mumbo-jumbo that makes most Crichton books guilty pleasures. The main problem has been translating those books into films (memorable failures include Congo and Rising Sun). 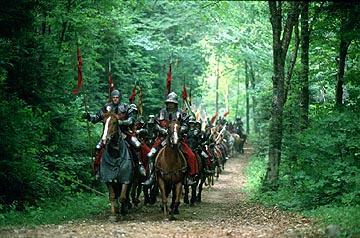 Director Richard Donner (Lethal Weapon 4, Conspiracy Theory) and adapters Jeff Maguire (In the Line of Fire, Toby) and George Nolfi do not care a whit about the science, they just want the same kind of thrills that other films with knights and castles can generate, but its just not there. The catapults are cool, but the fight scenes, and a huge siege sequence never feel that exciting. Instead, Donner has the characters, most of whom should probably be pretty smart, doing some pretty stupid things. One wants to smack O'Connor and especially Butler for some of their actions (and Walker for just being there). They know that they are there to rescue Edward, and that anything they do may have potentially serious ramifications in the future, yet they still do stupid things. Paradoxically, Marek's actions and the consequences of them are what make Butler so much more interesting than Walker. The human element of the story is also missing; there is no real connection between any of the characters, especially Edward and Chris. At the beginning, Donner establishes that Chris isn't really interested in archaeology, and as a result, is not too close to his father. He jumps at the chance to rescue his father out of a sense of loss, he feels he wasted time in the past, now he must make up for it. It all feels contrived and fake, only for the purpose of moving the plot along. Well, just as Chris isn't interested in archaeology, Timeline doesn't seem interested enough in itself. 1 hour, 56 minutes, Rated PG-13 for intense battle sequences and brief language.